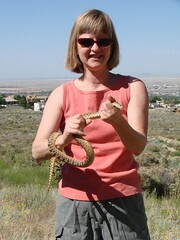 We decided we should release the snake in the foothills, but by then it was too dark. We put the snake in a pillowcase sealed with a couple of clothespins. Then we put the pillowcase in a plastic tub 6 inches deep. This morning, I looked in to see the snake coiled and still quite calm. About a half hour later, I heard a plastic cup fall over on the counter. The snake had moved — pillowcase and all — out of the tub and onto the counter, knocking over the cup. I put it back in the tub. PPS: I’m struck by the synchronicity of this incident from a few days before our snake encounter. I was spinning the dial and paused briefly to watch Franklin Graham eulogize his mother. He said that as a boy, he and his brothers loved to kill snakes — rattlers, any kind of snake. One particularly good summer, they killed over 70 snakes. He spoke with pride to an appreciative audience that smiled and chuckled. I wondered what kind of religion produces such a man. God bless the atheists. It isn’t a good idea to move [snakes] very far as they then encounter areas that they don’t know and often die as a result of not “knowing” where to find water, shelter, and prey. 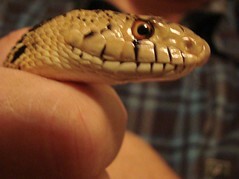 If you think the snake has been in captivity it is important not to release it in the wild. Snakes in captivity can come down with diseases & parasites (often caught from other individuals in captivity) that can then be transferred to wild snakes upon release of the previous captive.